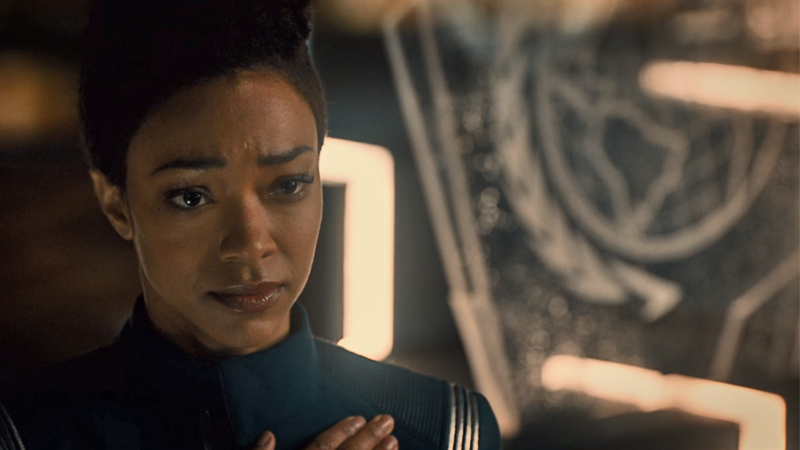 Burnham reclaims her badge at the end of Discovery’s first season. It’s finally here! After almost a year of waiting, Star Trek: Discovery is boldly re-entering our lives for a Spocktacular sophomore season of space shenanigans. But considering it’s been so long, we thought we’d remind you of where the good old U.S.S. Discovery found itself by the end of the first season. See you in hell, ya jerk. Remember when Captain Lorca revealed himself as a plant from the evil Mirror Universe, who fled to the prime Star Trek reality to avoid death for being part of a coup that, and I quote, wanted to “Make the Empire Glorious Again?” Because we certainly haven’t, ahahahahaha! Oh, god. Anyway, one kickass fight with evil Michelle Yeoh later—sorry, her most Imperial Majesty, Mother of the Fatherland, Overlord of Vulcan, Dominus of Kronos, Regina Andor, Emperor Philippa Georgiou Augustus Iaponius Centarius—Lorca found himself stabbed through the chest and left to tumble into the open warp drive of the Terran Empire’s flagship, so outside of some incredible asspulls, the Discovery needs a new captain going into its second season. After Lorca’s death and a rapid escape from the Mirror Universe with Emperor Georgiou in tow, the Discovery found its home a little worse for wear compared to where it had left it when it first “accidentally” (another gift of Lorca’s) ventured to the Mirror Universe during the midseason finale. Mainly because, without its sorta-top-secret super-cool teleport-y warship, the Federation’s war with the Klingons was going south. The Klingon’s armadas were practically on the doorstep of invading Earth, having encroached deep within Federation territory, wiping out starships and starbases aplenty. All that had taken its toll on poor Admiral Cornwell who, after nearly being broken by the sight of Starbase 1 laid waste by a Klingon raiding party, decides with Federation brass that they should use Mirror Georgiou to plant a bomb in an active volcano system on Qo’noS, the Klingon homeworld, rendering it uninhabitable and crippling the Klingon war effort. Mainly by killing a lot of Klingons! Understandably, Saru, Burnam, and the rest of the Discovery crew are not at all pleased with being unwitting pawns in an act of genocide, and after basically going to Cornwell and saying “What? No.” They manage to convince her to help them stop Georgiou from planting the bomb. One earnest chat with the assholish alt-universe counterpart of her dead ex-Captain later, and Burnham not only convinces Georgiou to not go through with the detonation but just... wander off, with no threat of Starfleet chasing her down. L’Rell makes an explosive political debut. Instead of using the already-planted bomb to do Some Genocide, Burnham’s compromise is to instead hand over its detonation codes to L’Rell, T’Kuvma’s former underling who had been held captive on Discovery for a while. It allowed her to end the war with the Federation and ascend to the position of Chancellor of the High Council, strong-arming the disparate Klingon houses into a unified society (under the threat of complete and total extermination, but hey, unity!). The crew of the Discovery take off, but not before leaving one of their own behind: Ash Tyler (who had been revealed as an elaborate Klingon Turducken of Voq—and then operated on to basically become Ash with a dash of Voq instead of Voq with a dash of Ash, god this show went some places!). He decided to stay behind with L’Rell, thinking that Starfleet wouldn’t want an ex-Klingon in a human skinsack hanging around. L’Rell wasn’t the only person to end the season with a promotion. For ending the war (and Not Doing a Genocide), the bridge crew of the Discovery were all awarded medals of honor—and Burnham had her “so you started an interstellar war” record expunged in the process, regaining her Commander rank and place in Starfleet as Discovery’s science officer. Even Mirror Georgiou got in on the fun in what eventually became a deleted scene released at WonderCon last year—approached by Section 31, the mysterious, morally grey Starfleet covert-ops spy group, she was offered a position that she happily accepts. Expect that to be a problem in season 2 and expanded on in her own newly announced CBS All Access series. So after that not-so-brief interlude, we’re back to Saru captaining the Discovery on the way to Vulcan at the very end of the season. Well, that is before they were interrupted by a priority one distress signal that saw them come face to face with a Starfleet icon...the Constitution-Class starship NCC-1701. Better known to you and I as the U.S.S. Enterprise. It was there that Discovery’s debut season concluded, but we now know that the Enterprise and her crew will form a major part of the second season—because before it gets its replacement captain, the Discovery is going to swap chairs with another familiar Star Trek face, who we’ll discuss in a minute. Three icons of the original Trek pilot: Captain Pike, Spock, and Number One. We’re meeting some famous faces from the original Star Trek pilot. The Enterprise’s arrival means we’re brushing up against the earliest bits of real-world Trek history—and with it, faces from the actual original pilot for Star Trek. Before James Kirk ever sat in a Captain’s chair, there was Captain Christopher Pike, played by Jeffrey Hunter in “The Cage” and now played by Anson Mount. He’ll be joined by the mysterious Number One, played by Majel Barrett in the pilot (who went on to provide the iconic voice of Star Trek’s computer systems throughout the franchise), and now played by Rebecca Romijn. Oh, and Spock too! Yes, Spock was around in the days before Kirk, so it’s totally fine in canon that we’ll be meeting a younger version of the famous Vulcan—who is, remember, actually Burnham’s adoptive brother—now played by Ethan Peck. Spock will play a crucial role in the season, having gone on leave from the Enterprise to investigate a series of mysterious beacons that have lead to a crisis situation that warrants Pike swooping in and commandeering the Discovery. Discovery’s traveling the old-fashioned way again. In season one, the Discovery traveled by the means of a fantastical “spore drive”—a top-secret piece of advanced bioengineering tech (partially by powered by a genetically altered Stamets) that allowed the ship to jump from point to point almost instantaneously. Damage to the mycelial network it traveled along caused by the events of Discovery’s journey into the Mirror Universe—and, err, the fact that genetically augmented humans who underwent processes like Stamets did are highly illegal in the Federation—has now lead to the Spore Drive currently being mothballed while the Federation researches a safer way to use it that preferably doesn’t require genetically altering someone to be a living battery. So now, like every other Starfleet vessel, the Discovery just moves along at warp speed. Klingons are gonna have hair again. Remember everyone got mad at the bald Klingons in season 1? Well, good news: They’re getting hairier again. The reason? Apparently, to honor the legendary Klingon warrior who founded the Empire in the first place, Kahless, Klingons ritually shave in times of war. Now that war with the Federation is over, they’re letting their long, glorious locks return. Q’apla! In the meantime, you should really watch those Short Treks minisodes. Okay so that one’s not really a thing to remember so much as a reminder that—if you’re in the U.S. and Canada, at least—in the run-up to season two’s debut, CBS released four 10-15 minute short episodes under the banner Star Trek: Short Treks, featuring Saru, Tilly, Harry Mudd, and a mysterious new addition to the Discovery universe. They were all actually really good little slices of Trek, so if you’ve not been following them, get in the mood before season 2 begins on January 17 and give them a watch!